GMAC: "Hey, Not A Big Deal, But Thought We'd Drop You A Line 'Cause That Bank Holding Thing? Probably Not Gonna Happen. NBD." GMAC Financial Services (GMAC) today announced that it has extended the early delivery time with respect to its separate private exchange offers and cash tender offers to purchase and/or exchange certain of its and its subsidiaries&apos; (the "GMAC offers") and Residential Capital, LLC&apos;s (the "ResCap offers") outstanding notes ("old notes") by three days to 5 p.m., New York City time, on Friday, December 12, 2008, in order to provide investors with a final opportunity to consider the GMAC and ResCap offers. Based on the results of the GMAC and ResCap offers to date, GMAC would not obtain a sufficient amount of total regulatory capital in connection with the GMAC and ResCap offers to meet the requirements set forth by the Federal Reserve for GMAC to become a bank holding company under the Bank Holding Company Act of 1956, as amended (the "BHC Act"). The Federal Reserve has required GMAC to, among other things, achieve a minimum amount of total regulatory capital of $30 billion in connection with its application. In order for such condition to be satisfied, among other things, the estimated overall participation in the offers would be required to be approximately 75% on a pro rata basis. The Federal Reserve has informed GMAC that if GMAC is unable to meet these capital requirements, it will not approve GMAC&apos;s application to become a bank holding company. As a practical matter, GMAC does not believe it has the ability to make further changes to the GMAC and ResCap offers following the new deadline at 5:00 p.m., New York City time, on Friday, December 12 and consummate the GMAC and ResCap offers prior to the end of the calendar year. Accordingly, if the requisite participation in the offers has not been received, GMAC management intends to withdraw its application to become a bank holding company. If GMAC is unable to successfully convert to a bank holding company and complete the GMAC and ResCap offers by December 31, 2008, it would have a near-term material adverse effect on GMAC&apos;s business, results of operations, and financial position. To date, approximately $6.3 billion in aggregate principal amount (or 22%) of the outstanding GMAC old notes have been tendered in the GMAC offers and approximately $2.0 billion in aggregate principal amount (or 21%) of the outstanding ResCap old notes have been tendered in the ResCap offers. The GMAC offers are conditioned upon, among other things, GMAC becoming a bank holding company under the BHC Act, concurrently with the completion of the GMAC offers (which condition is for the benefit of holders and cannot be waived by GMAC). The ResCap offers are conditioned upon, among other things, the completion of the GMAC offers. Except as expressly described above, the terms and conditions of the GMAC and ResCap offers remain in effect. The withdrawal deadline is not being extended. The GMAC offers are being made only (i) in the United States, to persons who are both "qualified institutional buyers," as that term is defined in Rule 144A under the U.S. Securities Act of 1933, as amended, (the "Securities Act") ("QIBs") and "qualified purchasers" (as defined in the GMAC offering memorandum) or (ii) outside the United States, to persons who are not "U.S. persons," as that term is defined in Rule 902 under the Securities Act and who are also both "non-U.S. qualified offerees" and "qualified purchasers" (each as defined in the GMAC offering memorandum). The ResCap offers are being made only to (i) in the United States, QIBs, or (ii) outside the United States, persons who are not "U.S. persons," and who are "non-U.S. qualified offerees." The complete terms and conditions of the GMAC and ResCap offers are set forth in the respective offering memoranda and other documents relating to the GMAC and ResCap offers (as each may be supplemented from time to time) which have been distributed to eligible holders, and eligible holders are strongly encouraged to read such documents carefully prior to making a decision with respect to the GMAC and ResCap offers. Documents relating to the GMAC and ResCap offers will only be distributed to holders of the GMAC old notes and ResCap old notes who complete and return a letter of eligibility confirming that they are within the category of eligible investors for the applicable private offer. Noteholders who desire to obtain a copy of the applicable eligibility letter should contact Global Bondholder Services Corporation, the information agent for the GMAC and ResCap offers, at (866) 794-2200 (U.S. Toll-free). 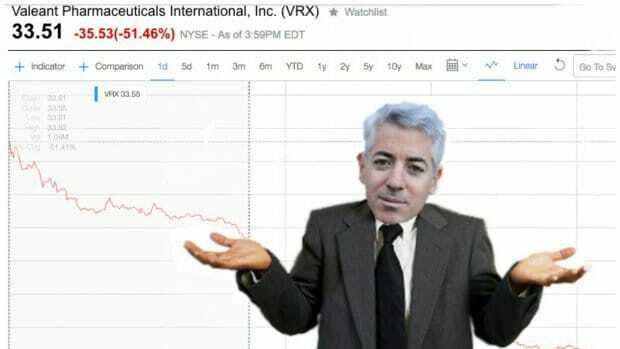 Give it up for Valeant!